After the rejuvenating spa session, it is time to enjoy a salad fest not far from Divana Virtue Spa. Baan Somtum is well-known for serving at least 22 varieties of Thai salads that include spicy, salty, sour and sweet flavors. Gibson came around lunch hour and noticed the restaurant was full of people, especially those from the business class, and he had no other choice but to wait patiently for an available table, but the wait was worthwhile, because it is so “thailicious”. This is not Grapefruit but Pamelo. However, you can confuse by the name in the menu, but it doesn’t matter, all you need to know is that this dish is delicious, and it is highly recommended if you like sour sweet. Crunchy green papayas with fresh prawns. The Thai salad that combines the sourness of lime, the sweetness of corn and the saltiness of salted egg into one bite. Khao niew in Thai is steamed glutinous rice that comes in a small basket, and it is available in most of the restaurants. Pla Sew or deep fried Silver fish is somewhat interesting as an appetizer. The fish is deep fried to a level of crispiness that you can eat the whole fish with bone and all, yet can having the softness of the flesh. Another deep fried dish but served with shrimp paste dipping sauce. It tastes rather like fish cake than fish ball, and the fish cake has the TomYum and Kaffir Lime leaves flavor. The dipping sauce is also very rich in flavor which has shallot, cucumber and coriander in it. The pork has a tender yet firm texture and the spicy sweet dipping sauce is so full of power. The name in the menu is rather long, but the fish that is stuffed with galangal steamed to perfection, and is enhanced by a very spicy dipping sauce. So a much more detailed name is needed. It is a Salacca or Snakefruit that we can buy back home. Here it is prepared as dessert which is somewhat uncommon. It is a sour sweet dessert since the Snakefruit has the taste of sour plum and texture of Lychee. Here is the map to indicate both of the hidden gems in Srivieng Road. Although Baan Somtum is located just along the Srivieng road, but due the restaurant’s location that is behind a car park, it is very easy for you to miss. 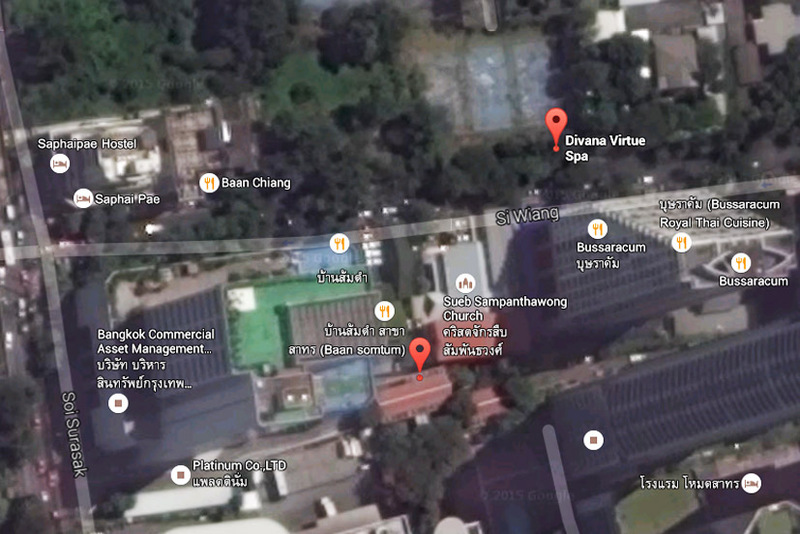 Address: 9/1 Soi Srivieng, Sathorn, Bangkok, Thailand. Operating Hours: 11 am to 10 pm Daily. The price list presented here is as on 7th September, the day when I visited the restaurant. All prices are subject to 10% service charge and 7% VAT.